Heat oven to 425°F. Line a baking sheet with parchment, or if using a cast iron skillet, place it in the oven to preheat. 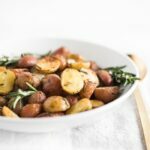 In a large bowl, toss potatoes with oil, garlic powder, salt, pepper and rosemary. Spread potatoes in a single layer onto prepared baking sheet, or in preheated skillet. Roast in the oven for about 20 minutes, stirring halfway through, or until potatoes are tender.